The game of the 2004 FIRST competition is FIRST FRENZY: RAISING THe BAR. The object of the game is to attain a higher score than your opponent alliance by delivering balls into goals, capping goals with larger balls, and/or having robots hanging from the Pull-Up Bar at the end of the round of competition. Two alliances comprised of two teams compete in each match, one red and one blue. Each team will have two drivers, one human player and one coach each match. The drivers and human player must be high school students. Only the human player may throw balls onto the field. Teams will become frenzied as they strategize on whether their robots will negotiate IR beacons during the Autonomous Period, herd small balls to Ball Corrals, cap large balls on goals, move mobile goals, climb steps or attempt to hang from the Pull-Up Bar. The object of the game is for teams� robots to trigger the Ball Release during the first 15 seconds, collect balls and feed them to the Human Players who will throw them into the goals. 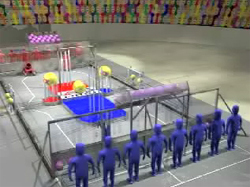 Robots will try to cap the goals with large balls to double the point value contained in that goal and attempt to end the match hanging from the center Pull-Up Bar. The final score is the result of adding small ball points in the goals, doubling the points for goals that are capped, and adding 50 points for any robot that is hanging from the bar. Each match will feature two-team alliances playing from opposite ends of the playing field. The robots from each of the four teams will be placed in starting positions straddling the white lines on the carpet in front of the drivers. The robots will be allowed 15 seconds to function autonomously, without driver control of any kind, to race to the Ball Tees, remove the balls and activate the Ball Release mechanism at their end of the field. After the "Autonomous Period," the robots will be under complete control of their drivers for the remaining 1 minute and 45 seconds of the match. If the Ball Release is not activated during the Autonomous Period, it will automatically activate at the 45-second mark of the match. This year�s game requires excellent coordination between the robots and very accurate Human Players. With multiple ways to score points, it will be necessary to track your score as well as your opponent�s score and make critical decisions near the end of the match. There will surely be a frenzy of activity as the clock winds down. 36 Teams (.pdf, 20KB) attended the 2004 FIRST SBPLI Long Island Regional. 292 Teams (.doc, 495KB) competed at Championships in Atlanta. 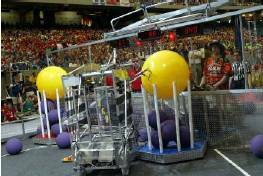 927 Teams (.pdf, 169KB) participated in FIRST during 2004 at 26 Regionals.